GLA fellows toured Scott Air Force Base in Illinois. The 2017 cohort of Global Leadership Academy has its final sessions together Friday, concluding an 10-month journey of leadership development and reflection and deeper understanding of the complexities of the Webster University network. 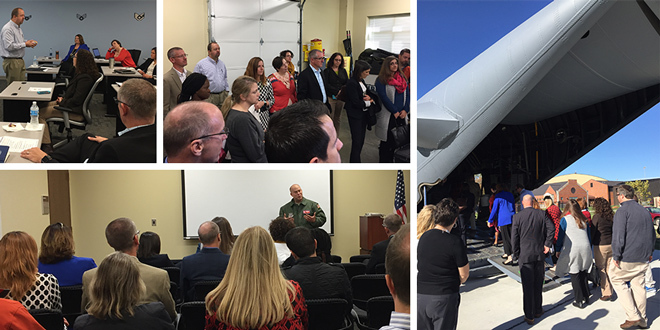 Fellows visited Scott Air Force Base on Thursday for perspectives on military and online education. The day included a tour of the base and medical evacuation flight simulators, a military student panel, a session with Webster's Scott Air Force Base director Susan Schultz, and a session with Michael Cottam, dean and associate vice president of Military Campuses and Online Education, to discuss both military and online learning strategic direction. Friday features a wrap-up session and group project presentations, followed by a graduation reception. The wrap-up session with John Buck, associate dean of Students, and Kelly Lyon, area director for Little Rock, is a chance to reflect and process "what's next?" for the fellows. Buck and Lyon will guide fellows in discussing their leadership toolkits and "avoiding the management vs. leadership trap." Both are fellow GLA alumni, and they will discuss their own stories of leading beyond GLA and building and maintaining strong connections going forward. Congratulations to the 2017 GLA fellows! 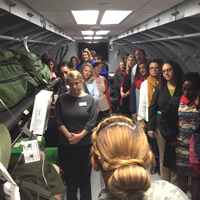 At Scott Air Force Base in Illinois, GLA fellows heard from dean Michael Cottam, a panel of military students, base personnel and director Susan Shultz, and toured facilities like the medical evacuation flight simulator. The 2018 cohort will be announced soon.